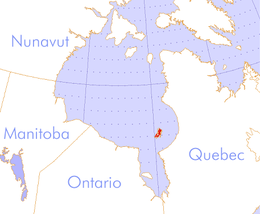 The Belcher Islands (Inuit: Sanikiluaq) are an archipelago in the southeast part of Hudson Bay. The Belcher Islands are spread out over almost 3,000 square kilometres (1,160 sq mi). Administratively, they belong to the Qikiqtaaluk Region of the territory of Nunavut, Canada. The hamlet of Sanikiluaq (where the majority of the archipelago's inhabitants live) is on the north coast of Flaherty Island and is the southernmost in Nunavut. Along with Flaherty Island, the other large islands are Kugong Island, Tukarak Island, and Innetalling Island. Other main islands in the 1,500–island archipelago are Moore Island, Wiegand Island, Split Island, Snape Island and Mavor Island, while island groups include the Sleeper Islands, King George Islands, and Bakers Dozen Islands. Before 1914, English-speaking cartographers knew very little about the Belcher Islands, which they showed on maps as specks, much smaller than their true extent. In that year a map showing them, drawn by George Weetaltuk, came into the hands of Robert Flaherty, and cartographers began to represent them more accurately. The islands are named for Royal Navy Admiral Sir Edward Belcher (1799-1877). In 1941, a religious movement led by Charley Ouyerack, Peter Sala and his sister Mina, caused the death by blows or exposure of nine persons. Thin-bedded Proterozoic sediments near Sanikiluaq hamlet. These rocks are about 2 billion years old. Width of bottom of photo is about 5 meters. The geologic units of the Belcher Islands are Proterozoic. 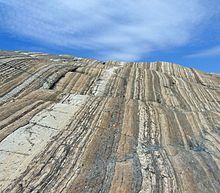 The exposed clastic sedimentary rocks, as well as volcanic and carbonate units record rifting and subsidence of the Superior craton during this period. There are two main volcanic sequences on the Belcher Islands called the Eskimo and overlying Flaherty volcanics. These volcanics form part of the Circum-Superior Belt. Several species of willow (Salix) form a large component of the native small shrubbery on the archipelago. These include rock willow (Salix vestita), bog willow (S. pedicellaris), and Labrador willow (S. argyrocarpa), as well as naturally occurring hybrids between S. arctica and S. glauca. Other than in valley regions, trees cannot grow on the islands because of a lack of adequate soil. The main wildlife consists of belugas, walrus, caribou, common eiders and snowy owls all of which can be seen on the island year round. There is also a wide variety of fish that can be caught such as Arctic char, cod, capelin, lump fish, and sculpin. The historical relationship between the Sanikiluaq community and the eider is the subject of a feature length Canadian documentary film called People of a Feather. The director, cinematographer and biologist Joel Heath spent seven years on the project, writing biological articles on the eider. In 1998 the Belcher Island caribou (Rangifer tarandus groenlandicus) herd numbered 800. ^ "Section 15, Chart Information" (PDF). pollux.nss.nima.mil. p. 322. Archived from the original (PDF) on 2004-11-19. Retrieved 2009-08-04. ^ Johnson, Martha (1 June 1998). Lore: Capturing Traditional Environmental Knowledge. DIANE Publishing. pp. 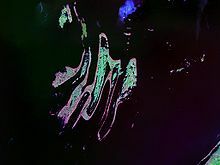 71–. ISBN 978-0-7881-7046-1. Retrieved 17 November 2012. ^ Harvey, P.D.A. (1980). The History of Topographical Maps. Thames and Hudson. pp. 34–35. ISBN 0-500-24105 8. ^ "'At the End of the World' tells a shocking tale of murder in the Arctic". Anchorage Daily News. March 26, 2017. Retrieved 2017-12-03. ^ Morton, James C. (2014-03-30). "Morton's Musings: When 'God' and 'Satan' battled in a barren land; the Belcher Islands Murders". Morton's Musings. Retrieved 2017-12-03. ^ Flora of North America. 7. Oxford University Press. 2010. pp. 64, 80, 83, 115. Retrieved 6 September 2017. ^ "People of a Feather (2011)". IMDBaccessdate=8 February 2012. ^ "People of a Feather". Retrieved 8 February 2012. Bell, Richard T. Report on Soapstone in the Belcher Islands, N.W.T. St. Catharines, Ont: Dept. of Geological Sciences, Brock University, 1973. Flaherty, Robert J. The Belcher Islands of Hudson Bay Their Discovery and Exploration. Zug, Switzerland: Inter Documentation Co, 1960s. Fleming, Brian, and Miriam McDonald. A Nest Census and the Economic Potential of the Hudson Bay Eider in the South Belcher Islands, N.W.T. Sanikiluaq, N.W.T. : Brian Fleming and Miriam McDonald, Community Economic Planners, 1987. Guemple, D. Lee. Kinship Reckoning Among the Belcher Island Eskimo. Chicago: Dept. of Photoduplication, University of Chicago Library, 1966. Hydro-Québec, and Environmental Committee of Sanikiluaq. Community Consultation in Sanikiluaq Among the Belcher Island Inuit on the Proposed Great Whale Project. Sanikiluaq, N.W.T. : Environmental Committee, Municipality of Sanikiluaq, 1994. Jonkel, Charles J. The Present Status of the Polar Bear in the James Bay and Belcher Islands Area. Ottawa: Canadian Wildlife Service, 1976. Manning, T. H. Birds and Mammals of the Belcher, Sleeper, Ottawa and King George Islands, and Northwest Territories. Ottawa: Canadian Wildlife Service, 1976. Oakes, Jill E. Utilization of Eider Down by Ungava Inuit on the Belcher Islands. [Ottawa, Ont. ]: Canadian Home Economics Journal, 1991. Richards, Horace Gardiner. Pleistocene Fossils from the Belcher Islands in Hudson Bay. Annals of the Carnegie Museum, v. 23, article 3. Pittsburgh: Carnegie Museum, 1940. Twomey, Arthur C., and Nigel Herrick. Needle to the North, The Story of an Expedition to Ungava and the Belcher Islands. Houghton Mifflin, 1942. 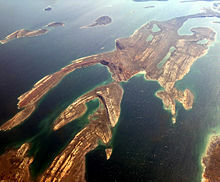 Wikimedia Commons has media related to Belcher Islands.